The Hairy Man of St Trinian’s, or, the Mowing Devil - Gef! Whilst researching the myths and legends of the Isle of Man, I recently came across a curious tale, that of the Phynnodderee of St Trinian’s. The Island is particularly rich in folklore – the result of Celtic, Norse and Christian influences – the Island being populated by numerous fairies, giants, witches, hobs, brownies, black dogs, water-bulls, water-horses, and other uncategoriable apparitions. A Phynnodderee (or Fynoderee, Fenodyree – spellings vary) is a hairy, human-like entity, thought to possess great strength. His appearance is noteworthy: he is covered in black, shaggy hair, and has fiery, glowing eyes. Etymologically speaking, the name means something like “the hairy one.”  The Manx translation of the Bible employs the term Phynnodderee in place of ‘satyr’: Hig beishtyn oaldey yn aasagh dy cheilley marish beishtyn oaldey yn ellan, as nee yn phynnodderree gyllagh da e heshey = “The wild beasts of the desert shall also meet with the wild beasts of the island, and the satyr shall cry to his fellow.” (Isaiah 34: 14). As a household fairy or goblin, the Manx Phynnodderee was of particular interest to me as a potential cousin to Gef, the Talking Mongoose. Such domestic fairies appear under various names in British and Irish folklore, as Hobs, Hobmen or Brownies. 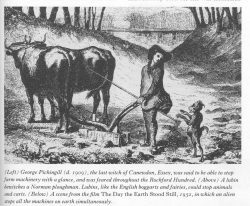 Like Gef, the Phynnodderee could be useful and hard-working, helping out with farm chores if given food and drink. But both were quick to take offence if they felt they had been treated with insufficient respect. Typical farm work undertaken by Phynnodderees, Hobs or Brownies might include threshing, mowing and locating lost sheep. At their isolated, remote farm, Doarlish Cashen, Gef assisted the Irvings, his adoptive family, by catching rabbits which he would leave outside the farmhouse door. These were welcome gifts, both as a supplement to the Irvings’ limited diet, and as an additional source of income for the poverty-stricken household when sold in Dalby village. Gef was also reported to have kept the farm outbuildings free from rats, and to have warned the Irvings of intruders. ove with a mortal Manx woman. Noting his absence at the harvest dance which regularly took place at the fairy court of Glen Rushen,  the King banished him from the court and condemned him to the life of a solitary wanderer upon the bleak Manx mountains and hills. The Phynnodderee’s love for a mortal woman thus endeared him to the Manx people, as did his helpful nature. He looks after cattle during the day and night, asking only for a bowl of warm milk. He is also known for his assistance when heavy or large objects are required to be moved from one place to another, or with time-consuming tasks such as ploughing. Thus, a man wishing to build a house at the foot of Snaefell mountain, at a place named Tholt-e-will, was aided by a compliant Phynnodderee who, in one night, moved a large number of heavy stones –including a huge piece of white quartz, much coveted by the man for his new home – up from the beach to the mountainside. There is an echo here of the peculiar circular design of certain Cornish churches, said to be constructed this way so that the Devil could not lurk round a corner and catch a person unawares. Perhaps one might also posit that this association of straight lines with malevolent spirits or demons lay in a distant memory of early Christian fear and suspicion of ley lines or ghost paths, having, as they did, a pre-Christian origin? 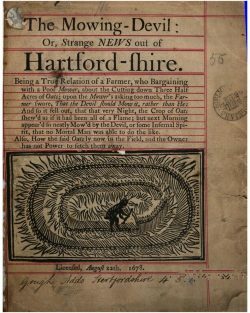 The pamphlet recounts the story of a farmer, who, in negotiating a fee with a “poor Mower” to cut three acres of oats, is so dissatisfied with the mower’s wage demands that he exclaimed he would rather the Devil himself do the work. That night, the farmer is disconcerted to see flames in his fields, and finds the next day that the oats have been cut in neat circles, too neat a job for a human hand… This tale has long been held by students of the crop circle mystery to be an early instance of the phenomena. Might the Manx soldier’s unusual grass cutting technique in the Phynnodderee story constitute an attempt to explain, after the fact, the appearance of a crop circle on the Island? Admittedly the classic crop circle does not evince cut-down or trimmed grasses, but rather, the grass or cereal having been seemingly trampled or flattened. But the general appearance would be the same, and the Round Meadow’s being cut from the middle outwards, in a circular pattern, is most suggestive. With thanks to Bob Rickard and Paul Sieveking. Glen Rushen is just a couple of miles away from Doarlish Cashen, home to the ‘Dalby Spook’ (alias Gef the Talking Mongoose) in the 1930s. Some commentators, including myself, view Gef as a modern, twentieth-century equivalent of the helpful brownie or house fairy. Chapter XVIII, ‘Popular Supersitions’; from Historical and statistical account of the Isle of Man from the earliest times to the present date, with a view of its ancient laws, peculiar customs, and popular superstitions, Joseph Train (Douglas: Mary Quiggin; London : Simpkin, Marshall & Co., 1845). Train credits this rhyme to Mrs E. S. Craven Green. The Mowing Devil was rediscovered by Bob Rickard and Paul Sieveking over 30 years ago, and was subsequently the feature of an FT article (FT 53, Winter 1989, page 38). This was during a period when the crop circle phenomenon was attracting much interest and speculation. The title had caught Sieveking’s eye in 1982, whilst working as a layout artist on the revised British Library Catalogue of Printed Books (BLC), as was Bob Rickard, who subsequently located the original pamphlet in the BL itself. Oddly enough, UFO investigators Jenny Randles and Paul Fuller (who were, at the time, also investigating crop circles – the simpler variety, they believed, being formed by natural vortices) had independently come upon a reference to the pamphlet’s existence around the same time. Something in the air? !